As I discuss in this answer, how the Vedas originated is that from time immemorial, sages known as Dhristas have heard mantras (sacred verses) directly from the gods during a state of Tapasya (deep meditation). And then in the Dwapara Yuga, a sage named Krishna Dwaipayana Vedavyasa (or Vyasa for short) compiled these verses into a set of four books we call the Vedas. (Technically Vyasa only compiled the Rig, Yajur, and Sama Vedas - the Atharvana Veda was compiled separately by the sage Atharva and Angiras). The verses of the Vedas come from the Tapasya of hundreds of different sages, and they're addressed to lots of different gods. So to preserve all this information, the sage Shaunaka (among others) compiled the Anukramanis, a set of systematic indices for the Vedas which, among other things, documents the sage who heard each verse from the gods, and the deity that each verse is addressed. My question is, is the Anukramani of the Rig Veda available online in English? The Anukramanis give lots of information for each verse, including information about poetic meter and content, but all I really want is the names of the sages and deities for all the hymns. Now this webpage claims to provide the sage associated with each hymn, but it's inadequate, because first of all it doesn't describe the case where there's ambiguity as to who the seer of a hymn is, and it also doesn't describe the case when different verses within a hymn were heard from the gods by different sages. And the Ralph TH Griffith translation of the Rig Veda claims to provide the deity of each hymn, but when different verses of a hymn are dedicated to different gods, it often just says "Various" and leaves it at that. As far as I know, the only source that has all the information I want is Oxford's 3-Volume translation of the Rig Veda, which just came out a few months ago. And I have compiled most of the sage and deity information from that book, but not all of it. So is there any online source that has the complete sage and deity information for all the verses of the Rig Veda? It took a lot of work, but through careful searching of the Oxford's Rig Veda translation through Google Books, I was able to compile most of the Anukramani's sage and deity information, except for some hymns in books 8 and 9 as I'll describe below. 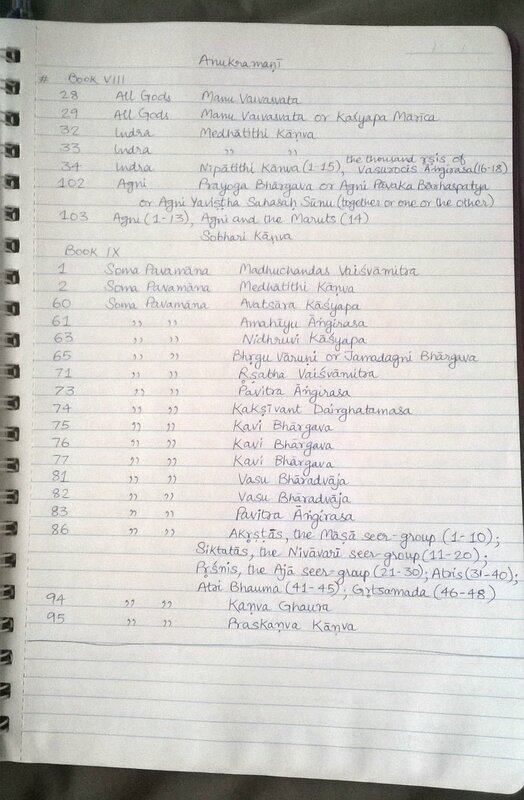 EDIT: The user hfdfh was good enough to write down a lot of the missing names in Books 8 and 9 here. So now I am just missing Hymns 40-100 of Book 8. Anukramanika is an index - The Rishi index needs to be made - The most authentic sources is Department of Maharishi Vedic Science. The mantra index - is found in Vedic Concordance Bloomsfeld - why it was needed was - you can guess - hiding truths of the Mayan and Hindu A Vedic Concordance. As an excel Spread Sheets in .xls : here and here. I recommend to check it once, it's very useful and in nice format. As MS Word document in .doc format : here. Not the answer you're looking for? Browse other questions tagged vedas mantras rig-veda translation-request rishi . How can we know that God has told us something? Were cows sacrificed in Gomedha Yagnas brought back to life as Chaitanya Mahaprabhu says?